Four is twice as better than two, right? In a cryptic message posted to its website Friday, Samsung invited us all to a “Galaxy Event” on October 11. 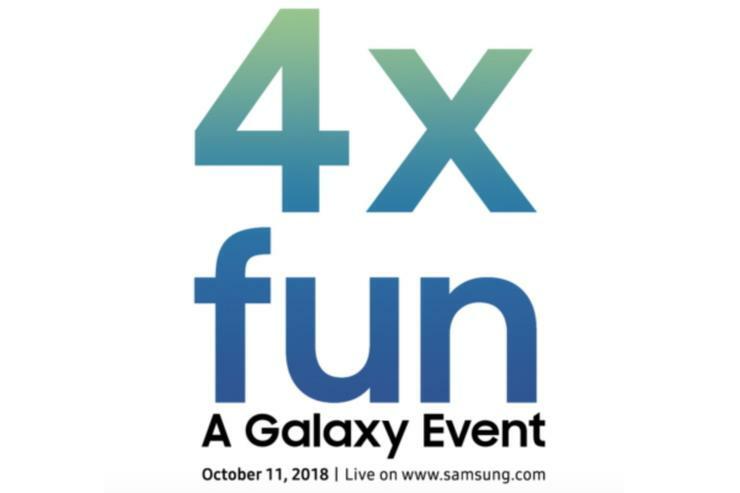 The message simply reads “4x fun,” and “Samsung’s newest Galaxy device is bringing more ways to express yourself than ever before,” a thinly veiled message to a phone sporting four cameras. Back in July, notable Samsung leaker Ice universe predicted on Twitter that “there will be a four-camera phones in the second half of this year,” and later qualified that all four lenses would be “at the back.” Samsung only just debuted its first dual-camera Galaxy handset with last year’s Note 8, while Apple and others have been selling dual-camera phones for years. And Huawei recently launched a triple-camera phone in the P20 Pro and is rumored to be putting three lenses in the upcoming Mate 20 as well. But four would be an industry first, and we all know how much Samsung likes being first. There have also been rumors of a folding phone arriving before the end of 2018, but unless the 4x refers to four screens, it’s unlikely Samsung would choose to spotlight the camera rather than the design. But still, color us intrigued. The presentation will be live-streamed on Samsung.com on October 11, just two days after Google is set to launch its latest Pixel phone. No time is listed for the stream. Why this matters: Anything Samsung does with its Galaxy phones is news, but we shouldn’t expect a new flagship phone here. Samsung already launched the Note 9 to cap off its premium lineup, and unless the fabled folding phone actually makes its debut, that should be it for 2018 Galaxy flagships. More than likely, this phone will be more of a mid-range handset like the Galaxy A series with a gimmicky feature. While smartphone makers spin their wheels with notches and slimmer bezels, the race to have the most camera lenses has become the one everyone wants to win.